Pope Francis will be selling off the Harley Davidson given to him in June. 35,000 Harley Davidson enthusiasts roared into Rome to celebrate the 110th birthday of the US motorcycle brand and packed into St Peter’s Square to receive a papal blessing. Pope Francis has even given up the Mercedes Popemobile used by his predecessor, Pope Benedict, to greet the public from Fiats these days. The Pope warns his flock that God is being "replaced by fleeting human idols which offer the intoxication of a flash of freedom, but in the end bring new forms of slavery and death." 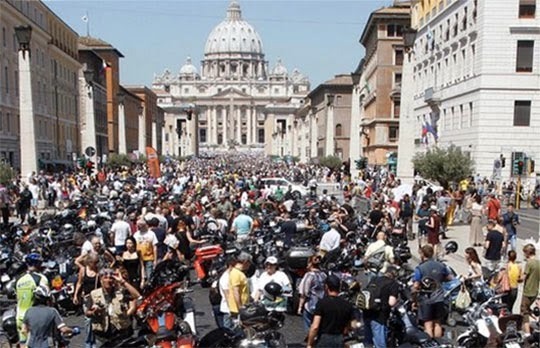 The Harley presented to the Pope will be auctioned to raise money for refurbishment at the hostel and soup kitchen. It would be interesting to get his opinion on the poor slob who wants to pay a fortune for the Harley Holy Roller. It seems Francis has no problem taking their money for a good cause, but still admonishing the riders who covet his ride.